Blog 2015 - What can Libraries do to Reduce Student Costs? What can Libraries do to Reduce Student Costs? "According to the Faculty Attitudes on Technology Survey conducted by Inside Higher Ed, 85% of faculty either always or usually provide students with access to a syllabus within the Learning Management System. Further, 54% either always or usually provide access to eTextbooks and related material via this mechanism." On October 8, 2015 ProQuest SIPX announced three options to support teaching and learning higher education workflows. SIPX is a technology specifically designed to provide clarity and transparency around content use in the higher education environment. SIPX ensures that students are not charged again for materials already paid for via their library. Campus technologies intended to facilitate student access to course materials may complicate the content distribution maze further, as faculty must learn how to incorporate readings into their Learning Management System (LMS) platform and to incorporate them in a way that ready student access is ensured. There is nothing like hitting a paywall to turn reluctant readers away from essential materials. Students accessing links from off campus can frequently encounter this obstacle. SIPX Central is a scalable self-service configuration that enables anyone at the school to set up a course reading that will be accessible within the Learning Management System. Ingesting university library licenses and surfacing freely available materials, SIPX provides instructors with the information that they need to create assigned readings for their students quickly and easily. By ensuring that students have access to the subscribed and free content, the service reduces the cost of course materials and simplifies the sharing of these materials between instructors and students. To date, implementation of the SIPX solutions have saved customers and students $3.67 million. Institutions that prefer to use a mediated solution for course materials, leveraging the expertise of libraries, bookstores, copy shops, instructional technology departments or other single campus units can utilize SIPX Campus. SIPX Campus was designed to support mediated workflows, saving staff time and ensuring substantial savings. While the course materials workflow that is currently in place at your institution may seem to be working just fine, this solution might rely on a heavily manual workflow that takes valuable staff time away from other essential activities. The inability to match assigned readings with library licenses programmatically could mean that students or departmental permissions budgets are paying again for library materials. This activity will also result in the appearance of decreased usage of library materials, an issue that could become critical at renewal time. 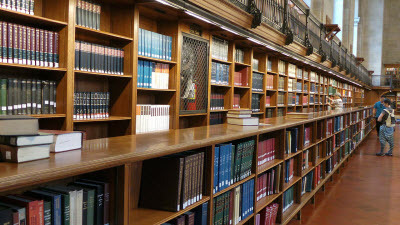 A recent survey detailed in eCampus News (http://www.ecampusnews.com/top-news/librarians-faculty-communication-237/) indicates a desire on the part of faculty and librarians for more collaboration when it comes to content supporting the curricula. How successful the libraries have been in developing content to directly support courses is a matter of some disagreement with two thirds of librarians scoring these efforts at "excellent" or "above average" with only 54% of faculty in agreement. Finally, new modes of instruction may not fit nicely into existing workflows. Three years ago, Massive Open Online Courses took the education ecosystem by storm. Building upon their significant expertise in online and distance learning, more and more universities are experimenting with their own offerings in this exciting new space. However, ensuring that the wide range of MOOC learners can utilize readings can be challenging and costly. The clearance process for these readings can be confusing and time consuming. With SIPX for MOOCs, the SIPX service team can assist with the clearance and creation of readings for these global courses. With a broad range of direct publisher and partner relationships, SIPX can leverage deep geography-based publisher discounts to reduce content costs significantly. Simplifying the permissions process ensures that courses launch on time, and SIPX analytics provide valuable insight for instructors, schools, libraries, and publishers regarding student engagement with content. Such information can be utilized to make future iterations of the course more effective. To further streamline the MOOC creation process, SIPX and Coursera, an education platform for online courses, have crafted a special offer enabling Coursera Partners to submit their first clearance request to SIPX at no charge. Through implementation of SIPX, campus stakeholders can realize immediate benefit and substantial savings. With the public clamoring for cost control in higher education and initiatives to lower student debt (http://www.huffingtonpost.com/entry/average-student-debt_562f766de4b0c66bae595a2c ), SIPX makes it possible for students to realize a 20-35 percent savings on their course materials. In addition, the "unbundling" of the course reader allows students to distribute expenses throughout the semester. Instructors who would rather assign subscribed and open materials to keep costs down, now have an easy way to compare reading costs and substitute subscribed or open resources when relevant. When non-subscribed copyrighted materials are the best choice, SIPX supports instructors with intuitive tools to license and share materials compliantly. SIPX is a technology specifically designed to provide clarity and transparency around content use in the higher education environment, and awareness of the costs this creates for students. SIPX also ensures that students are not charged again for materials already paid for via their library, which commonly happens in traditional campus course material workflows like bookstore coursepacks. There is nothing like hitting a paywall or a broken link, or creating unnecessary costs, to turn reluctant readers away from essential materials. Students accessing links from off campus or through technologies not built to pair seamless with LMS platforms can frequently encounter this obstacle. With 85% of faculty sharing reading lists with students and 54% providing eTextbooks within the Learning Management System, a technology that can easily integrate with the variety of LMSs in use on campus today is an important aspect in ensuring a positive, successful and cost-effective educational experience (1). 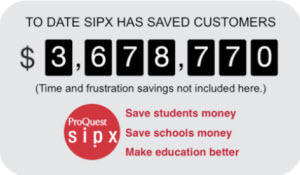 To date, implementation of the SIPX solutions have saved customers and students $3.67 million. SIPX Central, one option within the SIPX solutions, is a scalable self-service configuration that enables anyone at the school to set up a course reading that will be accessible within the Learning Management System. Ingesting university library licenses and surfacing freely available materials, SIPX provides instructors with the information that they need to create assigned readings for their students quickly and easily. By ensuring that students have access to the subscribed and free content, the service reduces the cost of course materials and simplifies the sharing of these materials between instructors and students. Libraries can play a key role here. A recent survey detailed in eCampus News (2) indicates a desire on the part of faculty and librarians for more collaboration when it comes to content supporting curricula. Finally, new modes of instruction are creating new challenges for existing workflows also. Three years ago, Massive Open Online Courses took the education ecosystem by storm. Building upon their significant expertise in online and distance learning, more and more universities are experimenting with their own offerings in this exciting new space. However, ensuring that the wide range of MOOC learners can utilize readings can be challenging and costly. The clearance process for these readings can be confusing and time consuming. SIPX for MOOCs was designed to help, where the SIPX service team assists with the clearance and creation of readings for these global courses. With a broad range of direct publisher and partner relationships, SIPX can leverage deep geography-based publisher discounts to reduce content costs significantly. Simplifying the permissions process helps courses launch on time, and SIPX analytics provide valuable insight for instructors, schools, libraries, and publishers regarding student engagement with content. Such information can be utilized to make future iterations of the course more effective. Through the implementation of SIPX, campus stakeholders can realize the immediate benefit and substantial savings. Public pressure is increasing to control the escalating costs of higher education and initiatives to lower student debt (3), SIPX makes it possible for students to realize a 20-35 percent savings on their course materials. In addition, giving students the option through the SIPX solutions to “unbundle” their coursepacks allows students to purchase by the week or by reading if they choose, to keep up in class even if cash-strapped at the start of the term from tuition and other expenses. Instructors who would rather assign subscribed and open materials to keep costs down, now have an easy way to compare reading costs and make informed decisions when assigning. When non-subscribed copyrighted materials are the best choice, SIPX supports instructors with intuitive tools to streamline licensing and share materials compliantly. In an era of increasing complexity for campus technology, IT Directors can easily integrate SIPX’s cloud-based, scalable system into their current LMS and teaching platforms. Online education specialists can leverage a fast and easy copyright and content tool to support the latest ed tech innovations. Librarians can ensure that university licensed materials receive the widest possible use to support teaching and learning, and the success of their student body. For more about SIPX, visit www.sipx.com.